This year was not a friend party year for Valerie, so we celebrated family style. 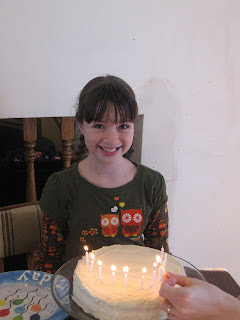 First, we had present opening and cake at lunch time before we spent the rest of the day away from home. 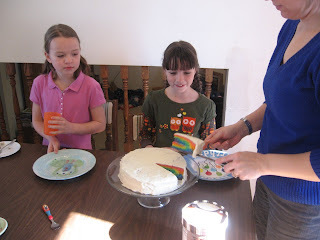 The kids were suspicious of the cake and thought it might be red/green inside. I would suggest frosting it with darker frosting if you make it. They were really excited with rainbow though and it was all fun. 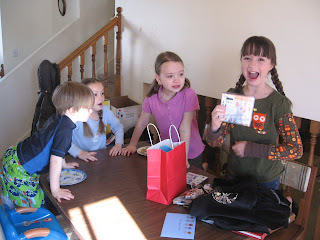 Valerie also loved all her presents and said she had the best day ever. We went swimming at the indoor pool in Lehi in the afternoon which was a blast. This pool had a baby area with little slides, a medium sized kid play structure with a slide and other water splashing items, as well as a regular sized water slide (the slide went on the outside of the building, but started and ended on the inside). There was a lazy river and bubble couch as well. The kids did not want to leave ever. But we were there way past dinner time, so we had to go. After, we went to an Indian restaurant called India Palace in Provo. It was fantastic as usual. I'm not thrilled with the writing on this site, but they explain how they made the cake with pictures as well. I of course did not make the cake that way, I just used a sour cream white cake recipe I have, then divided it into 6 bowls. I used gel food coloring I have to make the 6 colors and mixed it in the bowls. Then you prepare your pans. I learned a trick to make the bottom of the cake come out well and you use a plain paper napkin cut to fit the bottom of your pan. First you grease the pan, then put the napkin down, then grease again. When the cake is finished, you just pull the napkin off the bottom of the cake and it is perfect, your cake doesn't stick to the bottom at all. After you prepare the pan, start adding the batter into the pans. I did one pan red to purple, and the other purple to red. Add most of the red to the bottom of one pan, most of the purple to the bottom of the next pan. Then a little less orange on top of the red, little less blue on top of the purple, about half of the yellow on top of the orange, and half the green on top of the blue etc,,, until you end up with the last of the purple on top of the blue, and the last of the red on top of the orange. I kind of gently shook the pans so the batter would fill out the pan a little better (it is rather thick batter). Bake, then cool for a few minutes. I usually pull the cake out of the pan and cool on a wire rack. (pull the napkin off as soon as you can, sometimes it comes off in pieces, but get it all off). I evened out the tops with a long serrated knife so my cakes would stack better. Then I used the buttercream frosting recipe from previous post about cake making, and frosted the top of the first layer, then stacked the second layer so the bottom was on the top (do this so it isn't as crumbly). Now crumb coat, then frost like you want. It was fun to make, though I don't think I will make it all the time. Of course, I will never have the element of surprise again, but you could if you make it! Have fun. 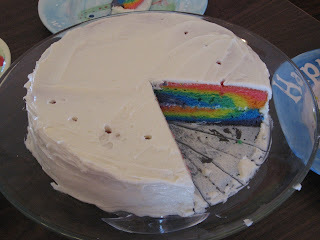 I seriously LOVE this cake! Thanks for posting how you did it! What a lucky girl to get a surprise like that! You are great at making cakes! Love ya, cousin! What a beautiful cake Becky! How fun is that! ?